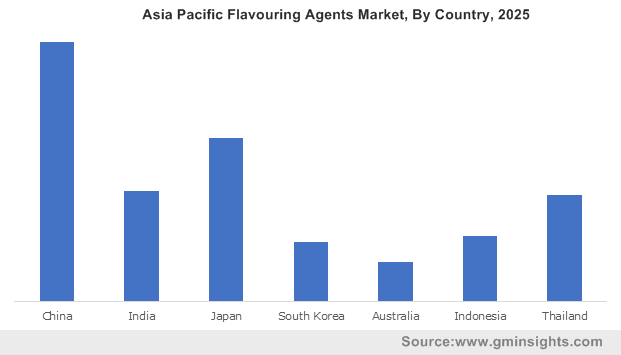 Global Flavouring Agents Market size was valued at over USD 15 billion in 2018 and is anticipated to witness over 4.5% CAGR up to 2025. Growing popularity of processed food & beverages in both developed and developing countries owing to changing consumer lifestyle will fuel the flavoring agent’s industry growth. Rising health awareness among consumers has resulted in increased use of flavors made from vegetables, nuts, fruit, seafood, wine, and spice blends. Also, the strong command of retailers and distributors over the supply chain coupled with a high rate of globalization in developing economies has resulted in ready availability and increased demand for the product. Shifting preference towards RTE, organic and convenience foods will supplement product utilization across a wide variety of applications. Increasing consumption of functional beverages among the young and geriatric population will provide a strong business outlook for flavoring agents market. Additionally, the increasing trend of dine outs, diners, and fast food joints coupled with growing consumption of exotic foods will drive the product sales in the food services sector. Stringent regulations pertaining to product labeling has urged the food & beverage manufacturers to incorporate natural flavors as it has higher consumer preferences. Natural flavors have a wide range of health-related benefits and have gained consumer acceptance as they are willing to pay premium prices for them. It was observed that majority of the consumers thoroughly scrutinized the product labels before purchase. This awareness among customers has prompted manufacturers to give more emphasis on natural flavors rather than their synthetic counterparts. Shifting consumer preferences towards tropical fruit flavors coupled with enhanced affordability will be a crucial factor affecting the industry expansion over the forecast period. Manufacturers have started implementing cutting-edge technology for their production process which has enabled them to reduce the bottlenecks and enhance their product portfolio. For instance, In July 2016, Sensient Technologies Corporation announced the launch of a new line of natural flavors such Black Cherry, Wild Amarena, Sweet Attika, Spicy Cherry, and Sour Morello from its new production facility in Missouri to fulfill the growing demand for sophisticated beverage flavors. 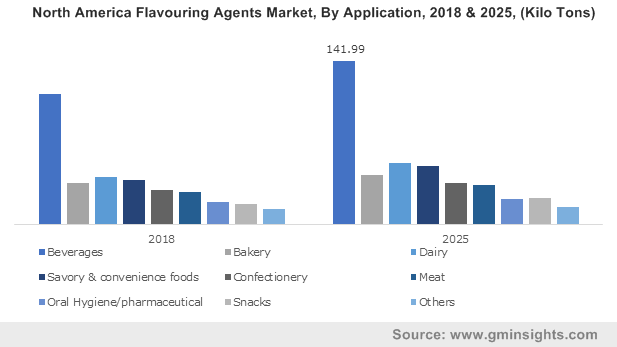 Extension of approved food additives list by the EU and FDA accompanied by government efforts towards introducing novel natural flavoring agents will positively influence the flavoring agents market share. High costs associated with the production of flavors with respect to raw material and stringent regulations to achieve clean product labeling may restrain the industry growth. For instance, European Flavor and Fragrance Association (EFFA) has regulated the concentration range of flavoring agents to be added in snacks, dairy, beverage, bakery, savory & convenience foods industry due to their harmful consequences on human health. Beverages segment will dominate the global market owing to high use of flavoring agents in alcoholic drinks, hot drinks, juices, sports & nutrition drinks, and carbonated soft drinks. The rising consumption of ethnic drinks along with lifestyle changes among adult populace across emerging countries will proliferate the market expansion. Additionally, strong demand for organically processed beverages is expected to be the major growth thrust for industry growth. Dairy segment accounted for more than 12% of the overall industry share in 2018. Rising consumer interest in probiotic beverages coupled with unscheduled eating habits will augment the segment growth. Flavored dairy products have experienced significant growth lately, as they are fortified with essential nutrients like magnesium, calcium, and potassium. Artificial flavors accounted for more than 50% of the overall industry share in 2018, owing to high demand for these products by food manufacturers to improve the taste, essence, and impart visual appeal to the end products as they are lost while food is processed. Key aspects including easy availability, low cost, and convenient manufacturing process as compared to natural ingredients will foster the segment growth. Natural flavors are expected to witness over 5% gains from 2019 to 2025. Rising consumer awareness regarding the benefits of consuming natural ingredients will improve the market share for these products. Increased production of alcohol, juices, and carbonated drinks with varied flavors will provide a strong business outlook for industry expansion. Also, growing instances of food poisoning associated with the consumption of artificial chemicals in food and beverages are further expected to bolster the demand for natural flavors. Asia Pacific is expected to register growth of over 5% by 2025. The rising consumption of snacks, confectionery, beverages, savory, convenience foods, bakery, and dairy products will boost the flavoring agents demand in the region. High purchasing power of the populace in countries including India, China, Indonesia, and Malaysia enables them to opt for fast food and convenience foods which extensively incorporates the use of food flavors. This will boost the demand for flavored products and improve the regional industry landscape. Additionally, growing preference for exotic and authentic flavoring additives in the economies of Europe and North America will provide new growth avenues for industry expansion. Europe accounted for more than 25% of the overall market in 2018. Modernization and globalization in European countries have increased the necessity for flavors in the food processing industry. The rise in consumption of low carbohydrate, low fat, and low salt food is the key factor stimulating the demand and consumption of flavored food. Since flavors are country and region specific, manufacturers have shifted their focus on acquiring a bigger market share by formulating customized flavors. 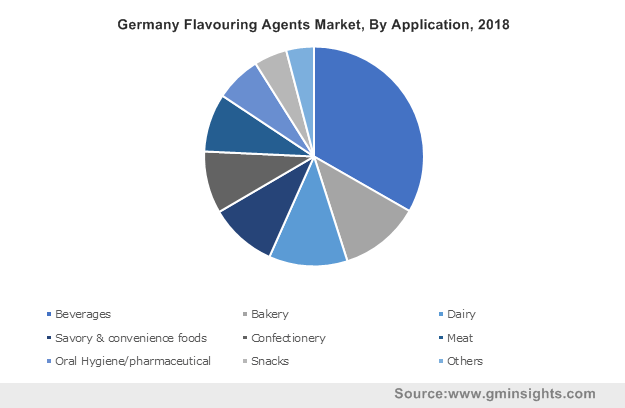 The presence of large flavor manufacturers across the region such as International Fragrance and Flavours, Inc, Frutarom, Givaudan, Firmenich will fuel the growth of the regional market. Flavoring Agents market is highly consolidated due to the presence of several industry players operating having a strong global presence. Key industry players include Givaudan, International Flavors & Fragrances, Firmenich, Symrise AG, and Sensient Technologies Corporation, MANE, Takasago International Corporation, T. Hasegawa, and Robertet. Product innovation, new product launches, mergers & acquisitions, and portfolio expansion, are among the key strategies of industry players for enhancing their share over the forecast period. Large multinationals are constantly focusing on expanding their production facilities along with upgrading their solutions to gain a competitive edge over their industry rivals. 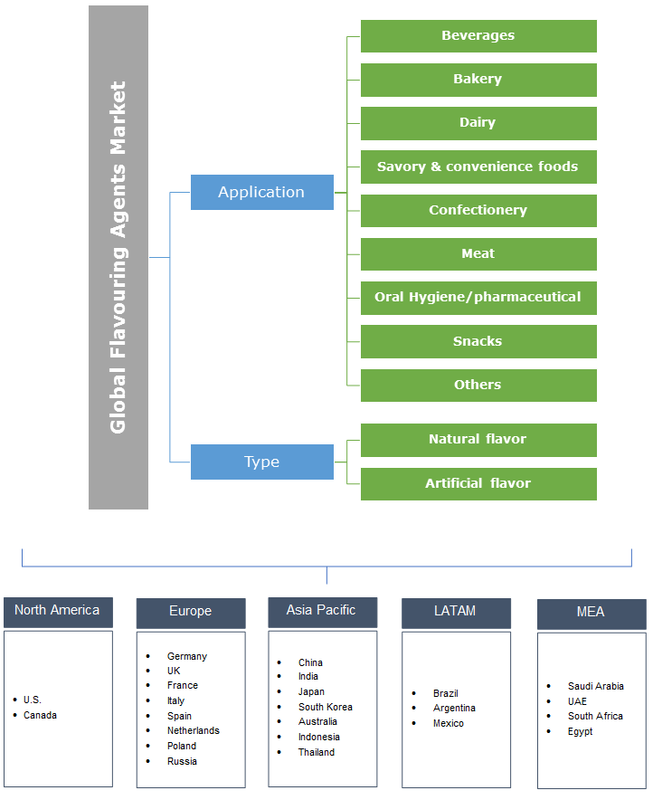 Global flavouring agents market is driven by innovations and varying taste preferences in the food & beverage sector. The beverage industry has been proactive in identifying the consumer behaviour and has invested heavily in R&D and product development with new flavours. Manufacturers are using new technologies for developing unique and appealing products to cater to the needs of the consumers. Developing economies such as India, China, Indonesia, Brazil, and Mexico will significantly impact product development owing to a large consumer base coupled with inclining preferences towards local tastes.